Kevin Newman and Jacob Stallings had a pregame conversation Tuesday about tweaks they'd like to test out in their swings. They decided to wait to make any changes until the offseason. Keeping everything status quo worked wonders as the second baseman, Pittsburgh's No. 7 prospect, and catcher both hit for the cycle in the same inning -- the second pair of teammates to accomplish the ultra-rare simultaneous feat in a game this season -- as Triple-A Indianapolis rolled Lehigh Valley, 12-5. 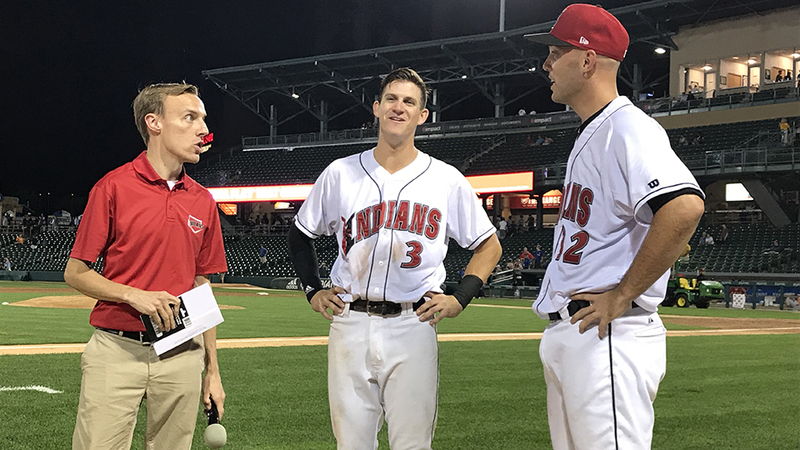 Newman was the spark behind Indianapolis' big night out of the leadoff spot, kicking off his milestone night with a double to left field in the first inning and scoring on Stallings' double to left. After Newman singled to center in the third, Stallings clubbed a leadoff homer to left in the fourth. The second baseman tripled to center in the fifth, and following Stallings' single to right in the sixth, Newman drove home two runs with another double to left. The scorching hot start made Newman and Stallings think back to the discussion they had before the game. "We were actually talking with (Indianapolis outfielder) Jason Martin about some of the new ideas of hitting, getting on plane with the ball, that sort of stuff," Stallings said. "Me and Newman were going to think about working on it in the offseason, exploring it a little more." Newman thought maybe Stallings had fast-tracked his new approach. "[Stallings'] first two at-bats were the double and the home run, so after he hit the home run, he came in the dugout and I was like, 'Are you doing what we talked about? Are you doing it?' He was like, 'No, I'm not. I didn't change.' And then six innings later, we do what we did. It was funny." Stallings was retired on a grounder to short leading off the seventh -- the only out for either player on the night -- setting up the historic eighth. The inning opened with a homer to left-center by Eric Wood. Two batters later, Newman crushed a solo blast to left, surpassing his previous best of four hits on May 12 against Columbus. "Our stadium is a pretty big stadium, and when I was up there for the last at-bat, I hit that ball and I hit it pretty good," he said. "I was just like, 'Oh man, I think maybe I got it. Maybe I got it.' I was going around first base and saw it go out and just immediately thought, 'Oh my gosh, that's the cycle. Holy cow.' I immediately just got super pumped up. I was really fired up." But the celebration was set to grow, though Stallings' cycle looked less likely. The University of North Carolina product had five triples over a seven-year career and none since 2015. But that didn't matter when he lashed a fly to center and raced to third, driving in a run. "To be honest, I wasn't even really thinking about hitting a triple," the catcher said. "I'm not the fastest guy in the world, so triples, I figure a couple guys have to fall down or something for me to get a triple. I knew I hit the ball well, but it was kind of tailing back toward the right fielder [Ryan Goins]. He was running over, and once I saw he missed it, I actually almost missed first base. I barely touched first, but then when I got to second, he already had the ball and was throwing it in. I was like, 'I'm going to get thrown out by 30 feet here, but I've got to at least try.' I guess the guys said that they kind of fumbled the relay, and I'm glad I decided to go." In the dugout, Newman and his teammates hung on every step. "That was insane," Newman said. "We knew he needed it, and he's a catcher and needed a triple which is obviously a hard thing to do. ... He hits that ball in the gap and we're all just screaming, 'Go, go, go!' He's rounding second base and they're throwing it in, and whatever happens and he makes it to third. He never stopped. Whether he was going to be safe or thrown out by 30 feet, he was not stopping. Just to watch him run as hard as he could around second base into third base was an awesome thing to see. Being for the cycle, having done it the same day that I did it, we're both great friends, so it was a really special thing." When Stallings returned to the dugout, Newman was lying in wait. "He just came in, and we saw each other and just chuckled and then gave each other a big hug like, 'Wow, this is pretty cool,'" Newman said. Although San Jose's Gio Brusa and Jalen Miller recorded simultaneous cycles this season, such feats even in close proximity of time are pretty rare among teammates. Just twice have two players hit for the cycle on the same day in the Majors: Bobby Veach of the Detroit Tigers and George Burns of the New York Giants on Sept. 17, 1920; and Stephen Drew of the Arizona Diamondbacks and Adrian Beltre of the Seattle Mariners on Sept. 1, 2008. The cycles were the fifth and sixth in Indianapolis history and the first since Josh Bell completed one on April 22, 2016 at Louisville. Newman and Stallings reveled in their big night. "We've got less than a month left in our season, and to have a game like this is just [amazing]," Newman said. "Especially these days, we're grinding here at the end of the season. It's hot, guys' bodies are hurting. It's starting to get to that point, and then to go out here and have a game like this, it's almost rejuvenating. It's the greatest feeling in the world." "I think the way I started off the game, I had a two-out RBI hit for our team to put us up in the first inning, and any time you can get a hit in that first at-bat always kind of sets you up for a good night. I don't really know if I ever really thought I was super locked in or if something special was going to happen tonight, but I've been feeling good my last couple games. I came back down from the big leagues and was playing every day and had to get my legs back under me. Once that happened, I feel like I've been swinging the bat really good in the box. I wouldn't have told you I thought the cycle was going to happen, but I'm glad it did."